What’s the essence of overclocking? Hardware components are incredibly the most important. 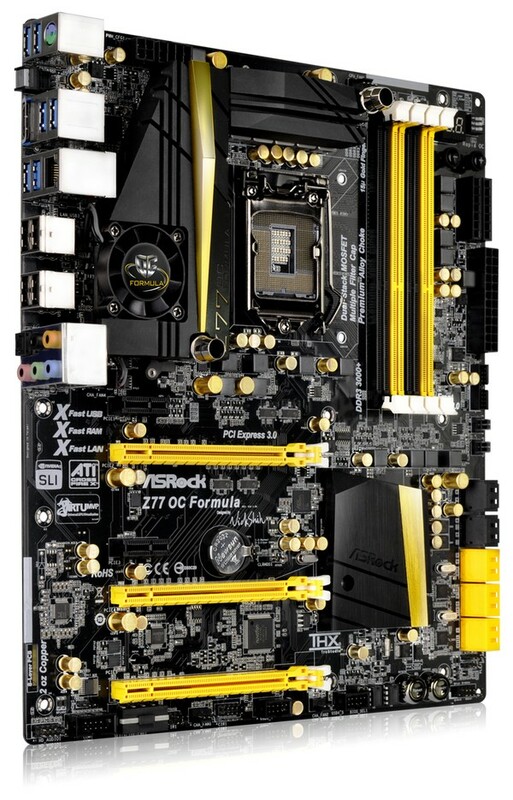 ASRock OC Formula is a brand that contains the very highest performing boards with a view to getting the highest results in overclocking. 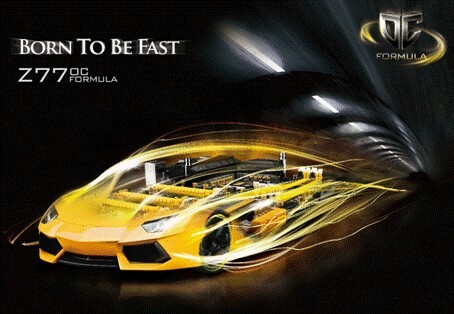 There’re plenty of attractive sweeteners to make the newborn Z77 OC Formula a more enticing upgrade. Z77 OC Formula has a CEB format, making it a rather large board, replete with 3 different useful kits that are ready for extreme overclocking. An overclockable motherboard relies on the stable current delivery. Formula Power Kit consists of 5 different enhanced solutions, delivering efficient power supply over the board. Equipped with CHIL 8328 silicon, ASRock Digi Power features a digital PWM, providing CPU Vcore voltage more smoothly. Dual-Stack MOSFET (DSM) gives larger die area with lower Rds(On), so the power supply for CPU Vcore is improved too. Compared to iron powder choke, the new Premium Alloy Choke (PAC) highlights a special alloy formula which is able to reduce up to 70% core loss. Multiple Filter Cap (MFC) includes a combination of highly conductive MLCC, DIP caps and POSCAP, helping the system filter noise from high-freq, mid-freq to low-freq, delivering enhanced and higher current to the CPU. A hefty 12 + 4 Power Phase Design features sturdy components and completely smooth power delivery as well. Nice cooling can unleash the overclocking capabilities. Formula Cooling Kit keeps mobo having good breaths when overclocking heavily. Twin-Power Cooling combines active air cooling with water cooling which maximizes the system’s convection to expel hot air out. 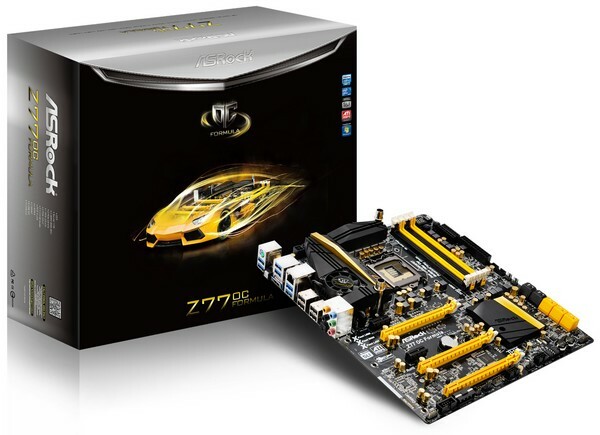 Built on an 8-layer-PCB design, ASRock Z77 OC Formula comes with 4 sets of 2OZ copper inner layers, delivering lower temperature and higher energy efficiency for overclocking. ASRock/GELID partnership provides an exclusive GELID GC-Extreme Thermal Compound as the free gift. ASRock/GELID applicator can even make the compound non-freezing even at low temperatures when doing LN2 extreme overclocking. Extra overclocking goodies extend to the onboard connectors. Formula Connect Kit only adopts the carefully selected materials to facilitate overclocking. Featuring a solid square-pin design, ASRock Hi-Density Power Connector supplies current to the power more efficiently and achieves better electric conduction. Overall, it reduces 23% power loss and decreases connector temperature up to 22℃. CPU sockets and DRAM slots are mounted with 15μ Gold Finger. With the unprecedented 15μ gold-inside design, overclocking the CPU and memory is easier than ever. Apart from the features above-mentioned, there’re some overclocking credentials on board as well. Rapid OC button ensures serious OC enthusiasts to get the highest level of overclocking performance by manually raising and lowering the CPU ratio, BCLK frequency and CPU Vcore voltage. For those who constantly need to remove then insert cards back into the PCIe slots and fear of damaging them, PCIe ON/OFF is three switches to enable or disable the PCIe slots in a flick of your finger. V-Probe allows overclockers to easily and quickly get the accurate voltage readings via the multitester. As important as hardware components are, an enthusiast’s board lives or dies by the quality of its overclocking options in the BIOS, and how easy they are to use. ASRock Z77 OC Formula comes with a good set of overclocking settings in the UEFI, making it an attractive proposition as well. 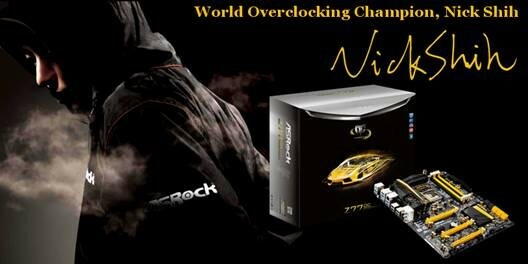 NickShih’s OC Profile provides a taste of Nick’s secret recipe for overclocking. It will automatically detect your CPU and offer you different levels of overclocking. Fine-Tuning V-Controller delivers more than enough voltage configuration options for overclockers who wish to pursuit extremes. Timing Configurator is a fast and easy tool that provides users with an abundant collection of subtle DRAM settings for professional tweaking. ASRock Interactive UEFI is a blend of system configuration tools, cool sound effects and stunning visuals, providing a more attractive interface and a lot more amusing. Multi-Thermal Sensor allows users to track and control the temperature of various parts of the motherboard graphically in both UEFI setup and Formula Drive. 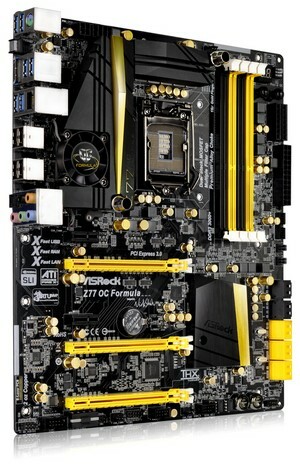 ASRock’s signature AXTU was renamed to Formula Drive with a new dress. It is an all-in-one software to fine-tune different features, which includes Hardware Monitor, FAN-Tastic Tuning, Overclocking, OC DNA, IES, XFast RAM and Multi-Thermal Sensor. Special mention here is the innovative FAN-Tastic Tuning. It offers the flexibility to adjust the fan speed relative to the system temperature.